As much as I love Disney Princesses, I thought it would be fun to think about some other princesses as well. So, here are my Top Three. 3. Princess Fiona: From Dreamworks’ 2001 film Shrek, Princess Fiona embodies what true love really is. For you younger readers who may have missed the film, you may want to skip the rest of this paragraph in order to avoid plot spoilers! Take my word for it—you should watch the movie! For the rest of you: Remember how Fiona is waiting for a handsome knight to rescue her, and is totally unprepared to deal with Shrek, an uncouth ogre from a swamp? As often happens in movies, Fiona falls in love with Shrek and isn’t very excited to meet the prince she is supposed to marry. Eventually Shrek proclaims his love for Fiona. To Shrek’s surprise, true love’s kiss reveals Fiona is also an ogre. The movie turns Disney princess stereotypes on their heads. Instead of idolizing the beautiful girls with tiny waists, tiny feet, and perfect skin, we see Princess Fiona finding happily ever after with green skin, a plump figure, and wiggly ears. It’s refreshing to see a movie challenge us to be ourselves, instead of making us feel like we’ll never measure up. 2. 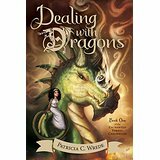 Princess Cimorene: In case you missed it, Dealing with Dragons, the first in Patricia C. Wrede’s Enchanted Forest Chronicles is a funny look at what happens when a princess volunteers to be captured by a dragon. Cimorene spends half her time chasing off unwanted knights intent on rescuing her and she spends the rest of her time cooking cherries jubilee, practicing magic spells, cataloguing treasures and deciphering ancient books. Of course, when Cimorene’s dragon, Kazul, falls ill, she has more to do than organize the storerooms. Cimorene’s quick wit, bravery, and determination to be her own kind of princess are endearing and make her one of my favorites. 1. Cinder: I know, I know. You are all going to be sick of me talking about Marissa Meyer’s The Lunar Chronicles. However, when thinking about my favorite princesses, I couldn’t leave her out. The best mechanic in the city, and a cyborg to boot, Cinder is smart, resourceful, and caring. 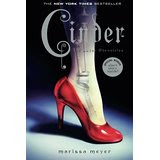 Saddled with a prosthetic foot and hand in a society where cyborgs are second-rate, Cinder is self-conscious, but never hesitates to help others. As the series progresses, she is constantly in a position to rescue those around her. She makes hard choices, always at her own expense. More comfortable with a smudge of grease across her face than in a fancy dress, Cinder is the kind of princess I would want to be. Great post! I love these princesses! Thanks! : ) I have some people to thank for some of the reminders! I am not familiar with any of these princesses. This is a great post, Laura! It's nice to see some other princesses represented. Thanks for the wonderful suggestions! Wow, wrong name! I don't know how I got it in my head that Laura wrote this... So sorry! Fun post, Erin! I adore Princess Fiona, she's so spunky and I agree that the twist of her turning into an ogre sends a great message about being true to ourselves. I haven't read the Enchanted Forest Chronicles or Lunar Chronicles yet, but they're on my list! Have to agree with you about Cinder. She's an excellent princess and that first book sucked me into the series. Even after I had read them all, Cinder is still my fave. (Sorry for fan-girling there; couldn't help it.) :-) I'll have to check out Cimorene from Dealing the Dragons. I LOVE Princess Fiona! Cinder is also one of the better heroines out there. Love her too.